Crossbreed makes a great IWB concealed carry holster. Crossbreed is the original creator of the leather and Kydex Inside the waistband concealed carry holster. There are many copies on the market now, and most are good, but as a longtime owner and user of two (now 3) Supertuck holsters, I believe they still make the best. Crossbreed was founded in 2005 by the late Mark Craighead who developed the design that has become the most comfortable and functional holster design currently on the market. 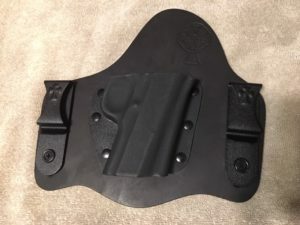 After trying many holsters myself, I finally took the advice of Tom Gresham of Guntalk fame and decided to spend some money on a really good quality holster and he recommended Crossbreed. I bit the proverbial bullet and ordered a Supertuck IWB Holster from Crossbreed for about $69. This was 10 years ago, the price has gone up a bit. There is a Crossbreed concealed carry holster for most gun make and models that will allow you to comfortably carry your weapon all day long. This is How I Carry My Kimber Pro Carry 1911 in a Crossbreed Supertuck Every Day. The IWB holster is made using a thick hunk of leather and a custom formed kydex pocket to securely hold your firearm. The kydex of each holster is unique to your particular gun model which is critical for the correct fit. The kydex completely covers the trigger guard, and the gun will snap into place. The Crossbreed Super Tuck is designed to carry with your shirt out or tucked in, thus the name “Super Tuck”. Comes with powder coated steel belt clips that can be adjusted for cant and ride height. They offer a “combat cut“ in which a small portion of the leather is removed near the grip so you can access the gun a bit more quickly. This cut will also reduce the comfort level, as it can allow the stock to dig into you in certain positions. Also available is a V-clip option for 10 additional dollars which offers the ability for deep concealment where the gun is actually below the belt line. See the website for more details on this option. The Kydex used on the front of the holster comes in OD green, sniper gray, or Tiffany blue, or standard black. The holster can be altered to handle some red dot sights . See the website for details. Crossbreed super tuck holsters come with a “two week, try it free guarantee”. 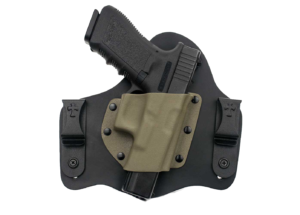 When you receive your holster you will have to full weeks to try it out and if not completely satisfied, you may return it for a refund minus the shipping charges. Crossbreed Holsters offers a lifetime warranty and will repair or replace your holster should it ever fail under normal use as long as you own it. I really like this holster. As I mentioned earlier, I have used this exclusively for close to 10 years now, and I carry every day. There were a few months that I used an Alien Gear holster instead in order to try it out. See my Alien Gear Cloak Tuck 3.0 review here. I really like the design of the holster and the steel clips allows it to be easily mounted and removed from my belt without removing it. Because it is worn IWB (inside the waistband) you will need to let a little slack out of the belt when wearing. You can see in the video how easy and quick it is to put the holster on without having to remove your belt. I am wearing a 1.5 inch Instructor Belt. I love that the belt clips are steel and not plastic. The Alien Gear holster I tried had plastic clips and in my opinion, when carrying with a tucked in shirt, these clips stood out like a sore thumb. The steel clips blend in a lot better and are much classier. The durability of this holster is fantastic. I have never had the Kydex loosen up, warp or otherwise cause an issue. The leather is a bit curled over on the top, but it has been forced that way by my body and is easily corrected. It is recommended to use leather care products on this holster from time to time, but I have never done this and the holster has held up remarkably well. I’m sure it would be even better had I cared for it the proper way! Long story short, as I think you can tell, I highly recommend this holster. I recently purchased a new Kimber Aegis Elite 1911, and even though it will fit into my current Crossbreed holster, I think a new gun deserves a new holster, don’t you? I am going to see if I get one for Christmas, and if not, I will be purchasing a Founders Series Crossbreed Supertuck. Update: I decided to ask Santa for a new holster, so here is my brand new Supertuck! Crossbreed makes awesome holsters, and heck, they really invented this type of holster. I have tried both and both will fit the bill. I cannot vouch for the durability of Alien Gear, but they also offer a Lifetime Warranty. Alien Gear came along and made it cheaper. And a little prettier. I had a few things about this holster that I did not like, you can see my review for a run down here. If you aren’t on a tight budget, buy a Crossbreed Supertuck, it is hands down the best IWB holster you will ever own. If you need to spend a bit less, Alien Gear will not disappoint. And they have a new line called Alien Gear Shape Shift Holsters. Check them out. I use my Crossbreed all of the time. I have worn it for many, many hours each week for many, many years now. It looks a little worn but it is so easy to put on, and mine has not loosened up, NEVER needed adjustment, and it secures my Kimber Pro Carry as good as it did when I bought it. I believe that if you purchase a Crossbreed Supertuck, you will have a trusted holster for a lifetime of concealed carry needs. Also check out my review of the Desantis Die Hard Ankle Holster. Please leave comments or experiences below! I would love to hear from you! Hey Dave. Thanks for this article. The Crossbreed Super Tuck looks like an incredible concealed carry holster. It’s really too bad that I live in NJ, which makes it a no-no unless you can get a special permit (very hard to do, if not impossible). It’s nice though and impressive, that when you are wearing it, you can’t feel it even when driving. Thanks also for the video demonstration! Steve, thanks for reading and commenting! I am sorry to hear you live in NJ! I actually was born there but have lived in PA for most of my life. I know it is almost impossible to get a concealed carry permit in that state. PA is much more gun friendly, at least for now! 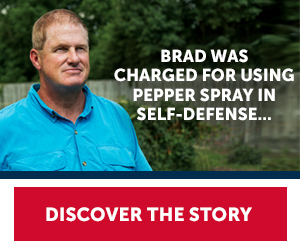 After watching your video really easy to put on the belt the case for weapons that you promote. Constructed with excellent quality leather it can withstand many years, with proper use. I also have 2 weeks to try it with a money back guarantee provided by the manufacturer. I will contact you before making the purchase. Thanks for stopping by and reading my review. If you decide to purchase a Crossbreed Holster, you will not be disappointed! Crossbreed Concealed Carry Holster honestly looks really viable and impressive in my eyes for numerous reasons. First of all, the number of features that it delivers is just insane. I really like that it works with both- shirt out or tucked in and has coated steel belt clips, as these features make for some comfortable positioning, which is super important and crucial aspect. And I also am huge fan of a combat cut, as it allows for accessing Your gun more quickly, but it does unfortunately reduces some comfort level. Another huge positive side of Crossbreed Concealed Carry Holster is its life-time warranty, which is honestly pretty insane and shows that the company truly cares about its customers & service. I also found their 2 week try it free guarantee to be a very welcome addition to the overall positive presentation. All in all, I am very impressed by the overall package and content that Crossbreed Concealed Carry Holster delivers, great stuff! Evald, thanks for your kind comments! I just bought my third Crossbreed Supertuck and am thrilled with it. 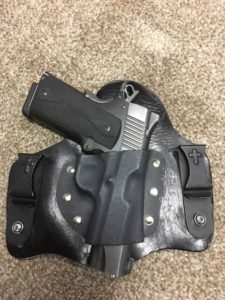 This has been my preferred holster for many years and as you can see in the review, holds up extremely well to hard use. The super tuck sounds like a very good IWB conceal holster and it certainly looks sharp. In viewing your video, it looks like it is very easy to put on the belt, but is it equally as easy to remove? Also, could this be secured to a pair of jeans, or would you not recommend that? I have a hard time with belts. 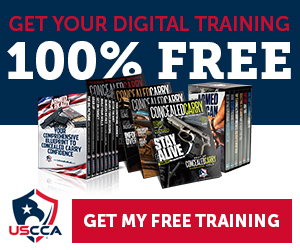 My new year’s resolution is to become certified to carry. Thank you for mentioning the Alien type, too. I think, though, if I am going to spend the money, I want one that has been tried and tested and it sounds like if you’ve used the super tuck one for ten years, that is the one to buy for the money. Karin, Thanks for your comment! Finding a comfortable holster can be a little more challenging for women although there are some good websites that cater primarily to women concealed carriers. 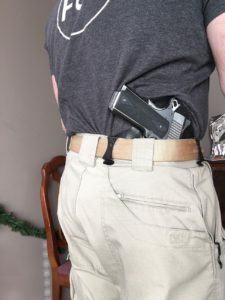 The crossbreed super tuck is designed to work with a sturdy gun belt, but I have seen some similar holsters that use a different kind of clip designed to clamp onto material such as jeans.